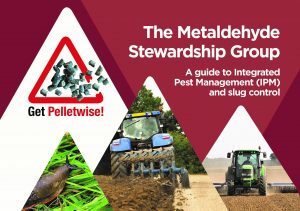 New slug control guide launched by MSG | Get Pelletwise! The Metaldehyde Stewardship Group has launched a practical guide on Integrated Pest Management (IPM) and slug control at Cereals 2017. Simon McMunn, spokesman for the Metaldehyde Stewardship Group (MSG) explained that the group has developed this resource in support of the enhanced stewardship and the requirement for heightened protection to the environment. “One of the four key stewardship steps for this year’s campaign focuses on the role of IPM and growers must only use metaldehdye slug pellets as part of a wider slug control programme,” he said. He highlighted that the guide is broken down into nine key steps. “The areas covered include; farm appraisals, soil and stubble management, planting methods, trapping, thresholds, treatment, record keeping, monitoring and evaluation and forward planning, all of which should be considered as part of slug control programmes,” said Simon. “This is because an integrated approach to slug control is more effective than relying solely on pellets and will help ensure maximum protection to water, birds and small mammals,” he added. Simon noted that many growers, with support from their advisers, are already implementing IPM on their farms. The guide will be available on the Water Stand, 407, at this year’s Cereals event and you can also request copies by emailing info@getpelletwise.co.uk.